DestroyIt 2360SMC high security shredder is a super micro cut shredder that is suitable for shredding highly classified documents since it is DOD approved and meets NSA/CSS requirements. The high security shredder has a high security rating of level P-7 with the shredded particles being so minute that they cannot be reassembled. It creates NSA Approved particles of 1/32” x 3/16” at a speed of 14 ft./min. DestroyIt 2360SMC shredder’s safety feature includes a transparent shield in the feed opening. It automatically oils the cutting blades to improve performance. 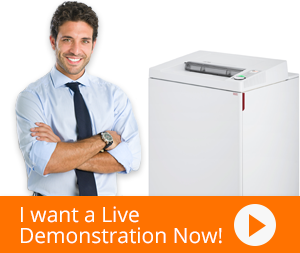 Whenever there is a paper jam, the shredder automatically reverses and shuts off. The built in Electronic Capacity Control of MBM 2360SMC indicates the paper quantity fed so that paper jam can be avoided. This paper shredder goes into sleep mode after an hour of non-activity to reduce utility expenses. When paper is placed near the feed opening, shredding automatically starts thanks to photo cell sensors. When there is no more paper, the shredding stops, it also includes caster wheels for mobility.